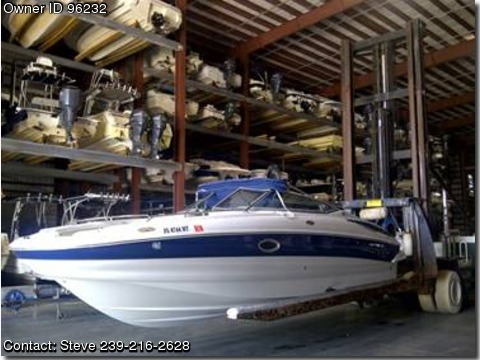 Please contact Steve @ 239-216-2628 or steve(at)thecarefreeboatclub(dot)com with any questions.NEW Engine: 5.7 Volvo Penta GXI I/O only 286 hours on motor, NEW coated oil pan, NEW Hydraulic power steering kit, NEW water pump, recently replaced manifolds and risers, fully serviced. NEW gimble bearing and recently replaced U-joint assembly in lower unit, Duo-Prop SS, trim tabs. Many newer parts replaced over time. Amenities:Depth meter, VHF, AM/FM CD stereo, Dual battery, Head, Fresh water washdown, Sink, Swim platform, Swim ladder, Full bimini, Cooler. Vessel in excellent condition, stored inside.